Note: Certain options here, if improperly configured, may cause PresenTense Time Server to stop functioning or function in a manner which makes it non-compliant with NTP/SNTP protocols. You should normally not need to modify any of the settings here but if you do, please read the documentation first or write an email to support@bytefusion.com for assistance. The default behavior for PresenTense Time Server on a multi-homed (more than one IP address) machine is to bind to ALL interfaces. In certain situations, you may not want certain time engines to bind to all interfaces so this option allows you to exclude interfaces. In the above example, the UDP Time Engine will not bind to the two interfaces shown in the Current Exclusions list. The Available Interfaces combo box shows the interfaces present on the machine. Tip: If you have an interface which is only present at certain times, launch this dialog when it is currently connected and add it to the exclusions list. You should not unnecessarily exclude interfaces as this does introduce some extra overhead for PresenTense Time Server. With Version 4.0 of PresenTense Time Server, advanced logging was introduced to the TCP, UDP and SNTP time engines. If you have a support issue, one of our engineers may ask you to enable one of these options. When the NTP4 plug-in attempts to connect to a clock on it's respective COM port and receives an error, the action taken can be configured here. Failure condition is when Windows reports failure to open the com port or a USB disconnect message is received from Windows (usually indicating the USB GPS cable has been physically removed or the driver has exited). In the event that the com port can be opened but the clock is not responding or is not plugged in or has been hit by lightning etc, this will not have any effect. Windows will report successful opening of the com port and an event clk_noreply will be generated by higher routines. The service will continue to monitor the clock and when it's plugged back in or the error condition is fixed, communication will be re-established. This essentially adds a low level port failure recovery mechanism. You can choose "Try Continuously" or choose a certain number of times to try with a configured number of seconds between attempts to open the com port. Note: With fallback configured for GPS clock and continuous polling chosen, be aware that in the event of an error, PresenTense Time Server will continue polling and never use the fallback source. It is therefore recommended to only use continuous when no other source is available as a fallback. Contact support@bytefusion.com for the latest list of drivers which support this option. This section currently has five settings and the documentation may not always be up to date with what actually appears here. Other options may be added without the documentation being updated. 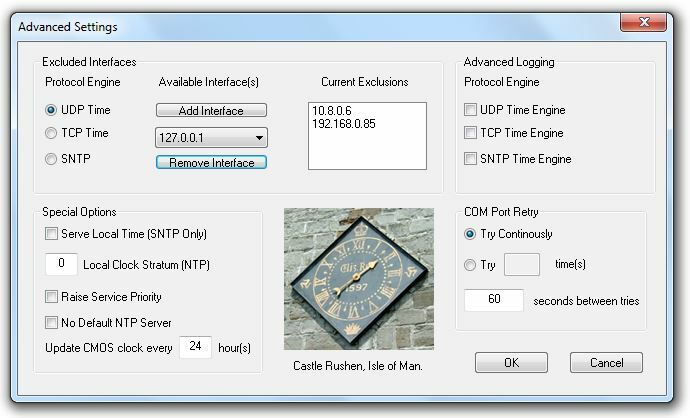 SNTP and NTP time protocols work only with UTC/GMT/Zulu time. Time clients are responsible for adjusting the offset from the standard time sent, including adjustment for DST Daylight Saving (Summer Time). Not all devices are capable of doing this so under some circumstances, you may want to serve local time, which is set by the locale in Windows. A good example of when this may be necessary is for devices which do not have the updated DST changeover times for 2007 and beyond. If you can set the offset in the device, set it to 0 and serve local time via this option. When you activate this option, the SNTP engine will automatically be chosen. Devices which simply display the time given will changeover immediately. Some devices may statistically analyze the sudden change and skew the time toward the new time served. Note: The computer on which PresenTense Time Server is running must have the updated DST changeover times installed. These are available from Microsoft. When using "Undisciplined Local Clock" with the NTP4 GPS driver, it is possible to fudge the local clock to be a lower stratum than it is. The reason you may want to do this is that many devices will not accept a stratum higher than 6 as a time source.